And, because I simply cannot leave you hanging with drool exiting your lips, here are the recipes for said snacks! 1. To prepare the sweet chips, preheat oven to 325 degrees F. Line a baking sheet with non-stick foil. 2. Slice flour tortillas into small chip-sized wedges using a pizza cutter or sharp knife. 3. Lay the wedges out on foil-lined baking sheet, and brush surface of tortillas with melted butter. 4. Sprinkle on the cinnamon and sugar. Give it a generous dusting, or two. 5. Bake chips for about 15-18 minutes in preheated oven. They'll come out golden and crispy like below. 7. Pour salsa out into a bowl, then add your 2 Tbsp of fruit preserves and splash of orange juice, if needed. It's ready to serve, or you can put it in the fridge overnight. Delicious, either way! 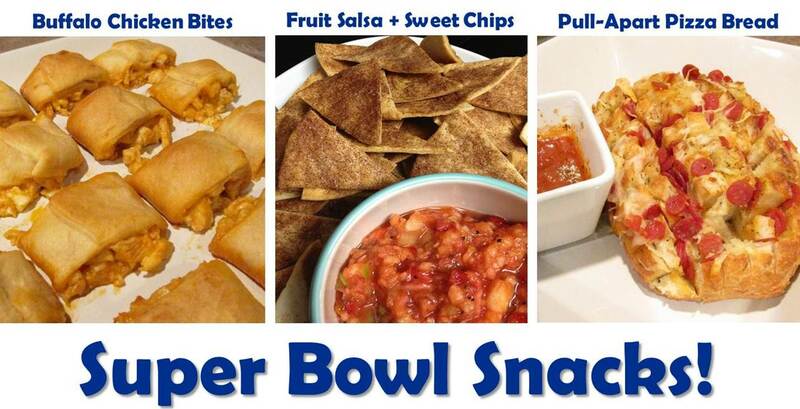 we made a very similar fruit salsa for the super bowl too. sooo yummy!